We always say onegai shimasu and arigato gozaimashita all the time in kendo and Japanese culture. It is important to know the meanings of the words and how to say them. Firstly let me talk about the word "onegai shimasu". "Onegai" is actually "O" + "negai". When we want to be polite we add "O" at the beginning of a noun. However, you cannot omit "o" from "onegai shimasu" to make a friendly, nonformal form. It is simply because "onegai shimasu" is a phrase that cannot be made into a friendly form, I guess. If I must come up with some kind of explanation, I have to explain the meaning of "onegai shimasu". When you say "onegai shimasu", you are asking others to do something. Maybe you are asking them for a favour. 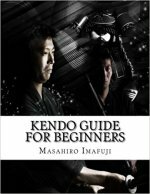 In kendo, when we say "onegai shimasu", we are saying "I ask you to train with me." or "Please train with me." When you ask someone for something, you should be polite, and that is why we do not have a friendly form of "onegai shimasu", maybe. "Shimasu" consists of "shi" and "masu". "shi" makes "onegai" a verb and "masu" makes the sentence a polite form. This is my best explanation since I did not learn Japanese grammar. First, I would like to explain "gozaimashita". "gozaimashita" is a past tense of "gozaimasu". Since we say this when we bow out after training, it is used in its past tense. Again, this is a polite form. "Arigatou", according to a Japanese dictionary, was changed from "arigataku" for the convenience in pronunciation. It was "arigataku gozaimasu" originally and over time it changed into the present form, "arigatou gozaimasu". Ok, now we know how the word was pronunced before and how it was changed. I would like to talk about the meaning of "arigato". It is to thank or to appreciate but I want to look at the original meanings of the word. To find out the original meaning of arigatou, it looks like we have to look at its ajective form, arigatai. Arigatai is originally meant "rare to exist". And it derived into the meanings such as "excellent", "precious" and "appreciation". * In modern Japanese we do not use the word, "arigatai", as the meanings, "excellent" and "precious". We need to know the meanings when we read old style Japanese writings. "I appreciate you because this does not happen to me all the time." It is rare, so you appreciate it. First of all, I want you to know that Japanese does not differentiate "L" and "R". Thus, we cannot hear the difference. When we write Japanese in alphabet, we use "R" as in "arigatou". However, it is not really "R". It is more of a sound between "R" and "L". Thus, if you hear Japanese, sometimes they sound like pronouncing "R" and sometimes it sounds like "L".